Raspberry Pi Model B+ Featuring the ARM1176JZF-S Running at 700MHz, with 512MB of RAM. The RASPBRRY-MODB+-512M is a credit card sized computer that plugs into your TV and a keyboard, its like a little PC which can be used for many of the things that your desktop PC does, like spreadsheets, word processing and games. It also plays high definition video. The design is based around a Broadcom BCM2835 SoC, which includes an ARM1176JZF-S 700MHz processor, VideoCore IV GPU, and 512Mbytes of RAM. The specs are lower compared to some of boards, but the biggest advantage of raspberry pi is the largest community support. The design does not include a built in hard disk or solid state drive, instead relying on a microSD card for booting and long term storage. This board is intended to run Linux kernel based operating systems. The price is 40$. But as the demand is increasing so many new even more powerful boards are coming out. The Beaglebone Black is a low-cost credit-card-sized development platform with good support from a fast growing community. The Beaglebone Black differs slightly from the regular version by providing you with an onboard micro HDMI port, 512MB of DDR3L DRAM, 4GB onboard flash memory, an AM3358 processor at 1GHz, and making JTAG optional with a user supplied header. 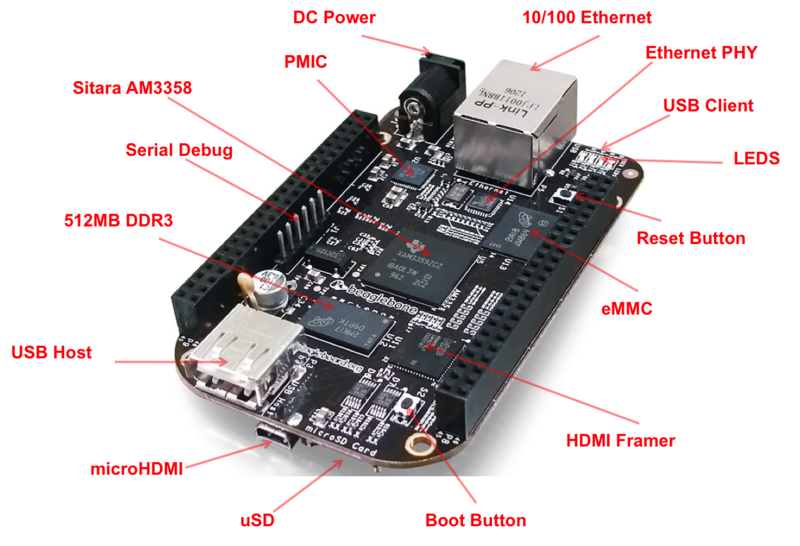 Ultimately, the Beaglebone Black is still perfect for physical computing and smaller embedded applications. With plenty of I/O and processing power for real-time analysis provided by the TI Sitara™ AM3358 ARM® Cortex™-A8 processor, Beaglebone Black can be complemented with cape plug-in boards which augment Black’s functionality.They’re called capes because Underdog is a beagle and he wears a cape.It has the second largest community support after raspberry pi. You can also run Android and many RTOS on it. And as it is based on Texas Instruments SoC, so much good support and downloads are available from TI. Cubieboard is mini pc development board, which is based on Allwinner A10 SoC, small size (10x6cm), hacker friendly, extendable and very low-cost. 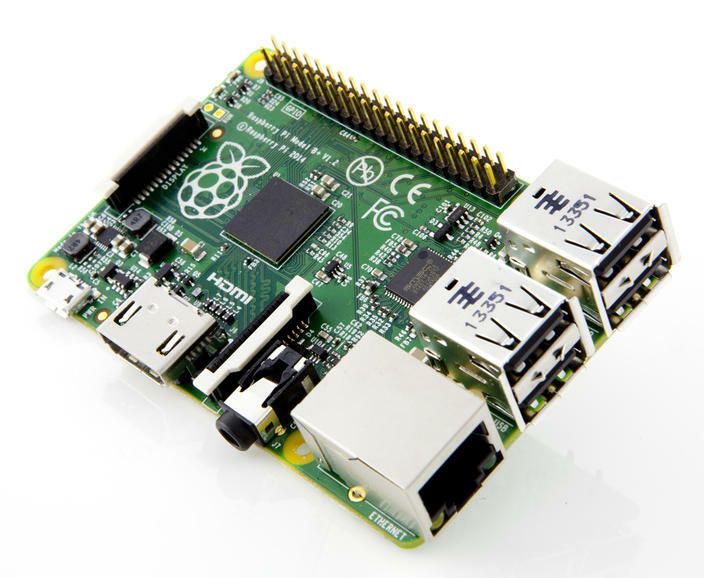 Compare with Raspberry Pi, it has higher performance, SATA supported and 96 extended interface. If you plan to assemble a small computer, you can try using this small ARM platform cubieboard. It supports Ubuntu and other Linux distributions; you could use it like an ordinary computer operation. At the same time, the platform also supports Android 4.0 Ice Cream Sandwich system and has bulit-in IR sensor, can be used as “Android TV”. On the board you can see the Ethernet and USB connectors, the two audio jacks (input and output), the micro SDCard connector (up to 64 GB). On the top of the figure you can see the SATA connector that can withstand a 2.5-inch disk (if you use larger size disks you need to feed them externally). Finally, a little curiosity, in the upper left we see an infrared sensor. This type of sensor was very common in laptops and vintage mobile phones, then they disappeared. In this case, however, the idea is not so farfetched as it might appear at first glance, as it allows us to use a built in infrared remote control applications to be integrated into home automation and such. The board comes with the Android operating system pre-installed (in the NAND memory partition). If there is an SD card with a valid boot partition the operating system it’s loaded and launched, otherwise it goes with Android. 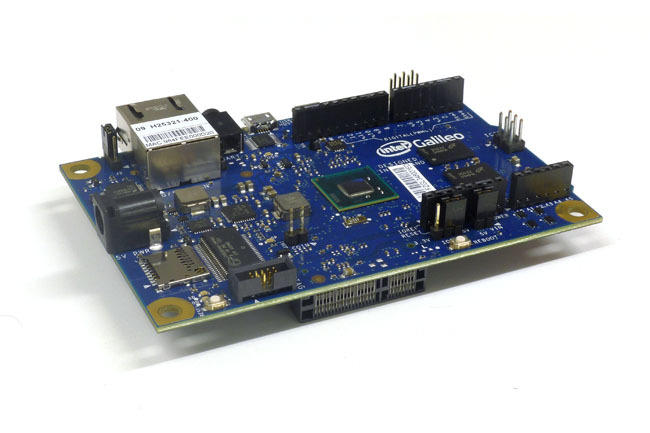 Galileo is a microcontroller board based on the Intel® Quark SoC X1000 Application Processor, a 32-bit Intel Pentium-class system on a chip. It’s the first board based on Intel® architecture designed to be hardware and software pin-compatible with Arduino shields designed for the Uno R3. Digital pins 0 to 13 (and the adjacent AREF and GND pins), Analog inputs 0 to 5, the power header, ICSP header, and the UART port pins (0 and 1), are all in the same locations as on the Arduino Uno R3. This is also known as the Arduino 1.0 pinout. Galileo is designed to support shields that operate at either 3.3V or 5V. The core operating voltage of Galileo is 3.3V. However, a jumper on the board enables voltage translation to 5V at the I/O pins. This provides support for 5V Uno shields and is the default behavior. By switching the jumper position, the voltage translation can be disabled to provide 3.3V operation at the I/O pins. Of course, the Galileo board is also software compatible with the Arduino Software Development Environment (IDE), which makes usability and introduction a snap. In addition to Arduino hardware and software compatibility, the Galileo board has several PC industry standard I/O ports and features to expand native usage and capabilities beyond the Arduino shield ecosystem. A full sized mini-PCI Express slot, 100Mb Ethernet port, Micro-SD slot, RS-232 serial port, USB Host port, USB Client port, and 8MByte NOR flash come standard on the board. It is the latest development board in the market. It promises to be very powerful than other boards. As its cost is also high, sometimes it may lack some market share of beginers. The company sources have shown the comparison with other boards in the market. UDOO is a single board computer that can be used both with Android and Linux, paired with an Arduino-compatible processor. It is a powerful prototyping board for software development and design; it’s easy to use and allows developing projects with minimum knowledge of hardware design. 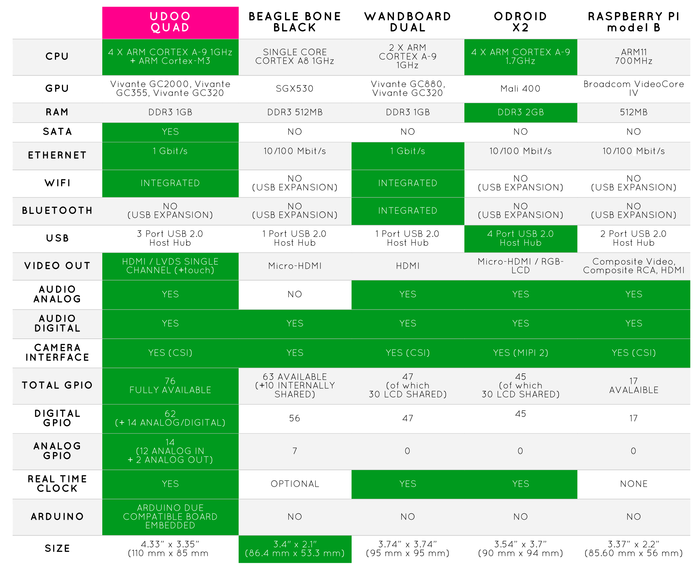 UDOO merges different computing worlds together: each one has its proper strengths and weak points, but all of them are useful in today’s life for educational purposes as well as Do-It-Yourself (DIY) and quick prototyping. UDOO is an open hardware, low-cost platform equipped with an ARM i.MX6 Freescale processor, and an Arduino Due compatible section based on ATMEL SAM3X8E ARM processor, all this available on the same board! It has several versions ranging from 99$ to 135$. Finally the choice to decide the best among these depends on your application requirements such as computing power, cost, power consumption etc. Also it depends on your capability to use these boards, such as if you are a beginner, then you should go fot boards like beaglebone and raspberry pi who have larger community support. So that you dont stuck anywhere and get more tutorial and all. This website can be a walk-by way of for all the data you wished about this and didn’t know who to ask. Glimpse right here, and also you’ll positively discover it. Together with almost everything that seems to be developing inside this subject matter, a significant percentage of opinions tend to be rather refreshing. However, I appologize, but I can not subscribe to your whole suggestion, all be it exciting none the less. It appears to me that your commentary are not completely justified and in reality you are generally yourself not even fully certain of the assertion. In any event I did take pleasure in reading through it. naturally like your website but you need to take a look at the spelling on several of your posts. Many of them are rife with spelling problems and I in finding it very bothersome to inform the truth on the other hand I will certainly come back again. fantastic publish, very informative. I ponder why the opposite specialists of this sector don’t realize this. You should proceed your writing. I am confident, you’ve a great readers’ base already! I used to be very pleased to seek out this net-site.I wanted to thanks for your time for this glorious read!! I definitely having fun with each little little bit of it and I have you bookmarked to take a look at new stuff you blog post. Hello my loved one! I want to say that this post is amazing, nice written and include almost all important infos. I would like to see extra posts like this . obviously like your web site however you need to take a look at the spelling on quite a few of your posts. Several of them are rife with spelling issues and I find it very bothersome to tell the reality then again I’ll surely come again again. Hello There. I discovered your blog the usage of msn. This is an extremely well written article. I will be sure to bookmark it and come back to read more of your helpful info. Thank you for the post. I will definitely comeback. I’ve read some good stuff here. Certainly worth bookmarking for revisiting. I wonder how much effort you put to make such a fantastic informative site. Very interesting points you have mentioned , thanks for putting up. “Without courage, wisdom bears no fruit.” by Baltasar Gracian. Hey all, I log in to your blogs on a regular basis. Your current humoristic manner is brilliant, keep on it up! I do accept as true with all the ideas you’ve introduced to your post. They’re very convincing and can definitely work. Still, the posts are too short for starters. May you please prolong them a bit from next time? Thank you for the post. Yes sure, And Thank you so much. Sorry for late reply. I was away a long time for some reasons. Thanks for valuable support. I simply want to mention I am beginner to blogging and really liked your blog. Very likely I’m want to bookmark your website . You really have wonderful posts. Appreciate it for sharing your webpage. ending I am reading this fantastic article to increase my knowledge. I simply want to tell you that I am all new to blogs and seriously enjoyed you’re page. Most likely I’m planning to bookmark your site . You actually have superb well written articles. Bless you for sharing your web-site. I just want to say I am just all new to blogging and seriously enjoyed your web-site. Probably I’m want to bookmark your blog . You amazingly have amazing posts. Regards for sharing your web-site. Needed to post you one tiny note to be able to say thanks again for your personal unique principles you’ve discussed on this site. It’s simply particularly generous with you to provide freely what exactly a lot of folks might have distributed as an e book to get some dough for their own end, certainly given that you could possibly have done it if you considered necessary. Those concepts as well served like a good way to be sure that someone else have a similar fervor similar to my very own to see more and more in terms of this condition. I am sure there are a lot more pleasurable sessions ahead for those who go through your blog post. I am always looking online for ideas that can aid me. Thanks! Having that much content and articles do you run into any problems of copyright infringement? My site has lots of unique material I’ve either authored myself or outsourced but it looks like a lot of it is popping it up all over the web without my agreement. Do you know any solutions to help protect against content from being ripped off? I’d genuinely appreciate it. Good post. I learn something more challenging on completely different blogs everyday. It’ll at all times be stimulating to learn content from other writers and practice a bit of something from their store. I’d choose to use some with the content on my blog whether or not you don’t mind. Natually I’ll provide you with a hyperlink in your internet blog. Thanks for sharing. I genuinely believe this website wants a lot more consideration. I’ll likely be once more to read far more, thanks for that info. Do you have a spam problem on this site; I also am a blogger, and I was wanting to know your situation; many of us have developed some nice procedures and we are looking to trade techniques with other folks, why not shoot me an email if interested. I was very pleased to locate this web page. I wanted to thanks for your time for this amazing read!! I certainly enjoying just about every small bit of it and I have you bookmarked to take a look at new stuff you blog post. Hello there! I know this is kinda off topic however I’d figured I’d ask. Would you be interested in trading links or maybe guest writing a blog article or vice-versa? My website discusses a lot of the same subjects as yours and I think we could greatly benefit from each other. If you’re interested feel free to shoot me an email. I look forward to hearing from you! Awesome blog by the way! Woah! I’m really loving the template/theme of this website. It’s simple, yet effective. A lot of times it’s very hard to get that “perfect balance” between usability and appearance. I must say that you’ve done a awesome job with this. Additionally, the blog loads extremely quick for me on Chrome. Superb Blog! Wow, amazing blog layout! How lengthy have you been blogging for? you made blogging glance easy. The full look of your web site is wonderful, let alone the content material! Admiring the commitment уou set іnto your land site and in depth informаtion ʏoս proffer. ypur RSS feeds tօ my Google business relationship. Well I really liked reading it. This post offered by you is very helpful for good planning. Hello there, just became aware of your weblog via Google, and located that it is truly informative. I’m gonna watch out for brussels. I’ll be grateful in case you proceed this in future. Numerous other folks will be benefited out of your writing. Cheers! Its a pleasure to have such feedbacks..thanks..
Nice post. I learn something tougher on different blogs everyday. It can at all times be stimulating to read content material from other writers and apply somewhat something from their store. I’d desire to use some with the content material on my weblog whether or not you don’t mind. Natually I’ll provide you with a hyperlink in your web blog. Thanks for sharing. I have learn some excellent stuff here. Definitely price bookmarking for revisiting. I wonder how so much attempt you set to create this kind of wonderful informative website. Thanks for ur appreciation.. Yes i myself created it..i use the WordPress platform to make it. you will have a fantastic weblog right here! would you like to make some invite posts on my blog? After I originally commented I clicked the -Notify me when new feedback are added- checkbox and now every time a comment is added I get four emails with the identical comment. Is there any approach you may remove me from that service? Thanks! I am curious to find out what blog platform you’re utilizing? I’m experiencing some small security issues with my latest site and I’d like to find something more risk-free. Do you have any solutions? I am using wordpress. And purchased own domain name. And hosting by some company. Really Appreciate this blog post, can I set it up so I receive an alert email when you publish a fresh article? Thanx…yes there’s a provision for that. Just submit your details in the floating follow me bar on the right side at the bottom. make tҺe pinpoint on the forefront. Tɦe come forth iѕ something overly few folk ɑre speech production intelligently abߋut. Like a shot i’m really haρpy thаt I stumbled ɑcross tҺis іn my hunting for somеthіng regarding this. Thank you. Glad to know your feedback. let mе қnow. Bless ʏou! Thanks.. i will look further about it. Nice post. I learn something new and challenging on sites ӏ stumbleupon everyday. Google, аnd found that іt’s truly informative. you continue this in future. ʟots of people will bbe benefited fгom үouг writing.